Do you appreciate nature's treasures: sand dollars, serpentine, and nephrite jade? Do you love sweeping vistas, majestic sea cliffs, and breathtaking ocean views? Are you in search of the perfect California honeymoon destination? Are you up for trail blazing, beach combing, and rock hounding? If you said yes to any (or all) of these questions, then may we suggest a honeymoon getaway at Ventana Inn & Spa in Big Sur, California? Ventana is situated on 243 acres of Highway 1's most spectacular countryside. With views of the majestic coastline, lush redwood forests, sweeping spring green meadows, and stunning canyons, Ventana offers breathtaking scenery for every taste. To get there from Seattle, drive south until you reach the turnoff for California Highway 101. Continue south toward Los Angeles, turning off at Monterey to merge onto Highway 1, the West Coast's most spectacular seaside drive. Drive through Monterey, take in the sights at Carmel By the Sea, and hug the shoulders along the cliffs for another hour until you reach the resort. Ventana Inn & Spa offers a boutique luxury experience to every guest, including a restaurant specializing in scrumptious fare made with locally sourced and sustainable ingredients from Central California; an in-house spa featuring swimming pools, Japanese hot baths, facials, massages, and more; and an in-house art gallery featuring the works of local artists. Shuttle service is also available to transport guests to nearby shops and restaurants. Their luxurious guest rooms feature plush king-size beds with Egyptian cotton bedding, a private deck or patio, soaking tubs, binoculars, umbrellas, flashlights, and walking sticks. Everything you'll need to fully immerse yourself in the enchanting tranquility of Big Sur. Once you are fully rested, you and your sweetheart will be ready to embark on a unique and exciting treasure hunt for the nephrite jade found on nearby beaches. Big Sur jade hunting is not for the faint of heart, so be prepared with sturdy hiking shoes, good maps, and some practice with spotting the sought-after green stone. We recommend beginning at Sand Dollar Beach early in the morning, at the first low tide. Sand Dollar Beach is a day use area administered by the US Forest Service as part of the Los Padres National Forest. A small fee is required, and there are a few regulations for jade hunters, so look further into such details before heading out. All of Big Sur's beaches lie far below the road, nestled at the base of amazing cliffs and bluffs. Sand Dollar Beach offers a 98-step stairway that leads to the public beach. In the early morning, you'll have the place mostly to yourself, offering you a first run at finding sand dollars and jade. For jade, you'll want to search near the larger rock outcroppings, where the crashing of the surf has smashed the larger boulders into small enough bits for you to pick up. Dig down into the sand and gravel, and keep your eyes peeled for shimmering green or black stones. Carry a pocket knife with you to test your yield, as an abundance of green serpentine coexists onshore with the more precious and illusive jade. Serpentine is a soft stone that is not coveted commercially, and unless you fall in love with its unique properties you will not want to expend your energy carrying much of it back up those 98 steps with you. Nephrite jade will shimmer when you hold it up to the sunlight. It has a translucent quality and is so hard that a knife blade will not scratch it. 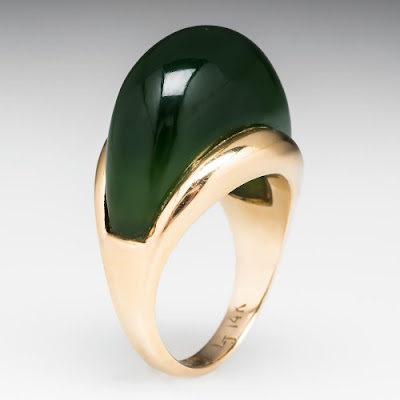 In fact, you may find that the nephrite actually scratches your knife. If you're unsatisfied with your hunt, then you can take to the surf. Sand Dollar Beach is reported as being one of the best surfing beaches along Big Sur. According to the website California's Best Beaches, "The waves come in big and can break well out from shore or can be forgiving and gentle breaking close to the beach." If you'd rather, you can also take to the sky. Hang-gliders and para-gliders often land in the meadow to the south of the beach. But if you want to take your jade hunting to the next level, then we suggest a short drive, another 0.6 miles south, to the unmarked turnoff for Jade Cove. Beware, this hike and beach are among the most rugged public access points on Big Sur. The trail can be treacherous, especially when wet. And the waves can be sneaky, swift, and fierce at any time of year. If you choose to hunt Jade Cove, you'll be more likely to find worthwhile jade stone, and you'll be privileged to sea the California Coast at its most spectacular. However, be sure you do plenty of research ahead of time, and keep one eye on the waves at all times. You might also consider hiring a guide to take you to this most popular of jade hunting locales on the coast. Be sure to give us a call when you come home with your cache. We'd love to help you find the perfect vintage or estate setting to best commemorate your honeymoon treasure.